I've been keeping my eyes on multiseat Windows for the longest time. 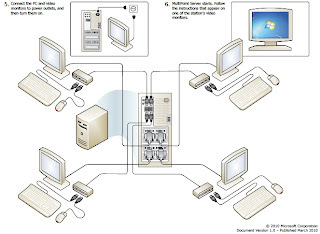 The idea of multiseat Windows is to connect two or more monitors to a single computer, and let two or more users share the computer, running different programs. There are a number of such solutions on the market, the most famous probably being BeTwin, but they all seem to be hacks and probably breaks some licensing agreements. I've tried using BeTwin, but it has very specific hardware requirements, and wasn't stable enough for my needs. Multiseat Windows seems like a throwback to the olden days where dumb terminals connect to a single mainframe for computing tasks, but it's actually quite different. The difference is that multiseating Windows actually involves having multiheaded displays on the system running Windows itself, instead of having a local display buffer like with most terminals. The market suddenly boomed this year when Microsoft announced MultiPoint Server 2010. MultiPoint Server is actually a combination of the two ideas above. It has to have multiple displays on the system itself, and yet it uses remote desktop services to generate the image. Through a friend's cousin's ex-girlfriend's uncle who works in the academic sector, I managed to borrowed a copy to give it a spin. I installed it on a cheap Gigabyte GA-MA78LMT-S2 motherboard with a low-end Athlon II X2 CPU and 2 GB of DDR3 RAM that I happened to have on hand. The installation is almost exactly like installing Windows Server 2008 R2, since MultiPoint Server 2010 is based upon that. 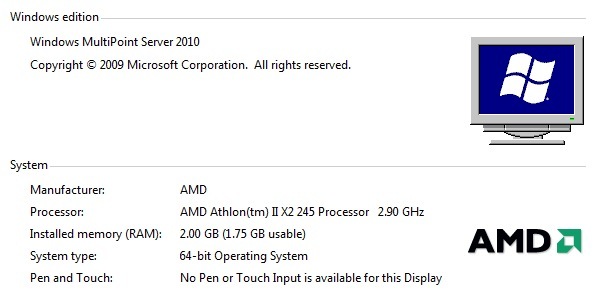 After installation, it gave me 3 days to activate, just like Windows Server. The Gigabyte board has two video outputs, DVI and VGA, I simply had to hook up two monitors (one DVI and one VGA), two USB keyboards, and two USB mice, and MultiPoint Server automatically detected everything. 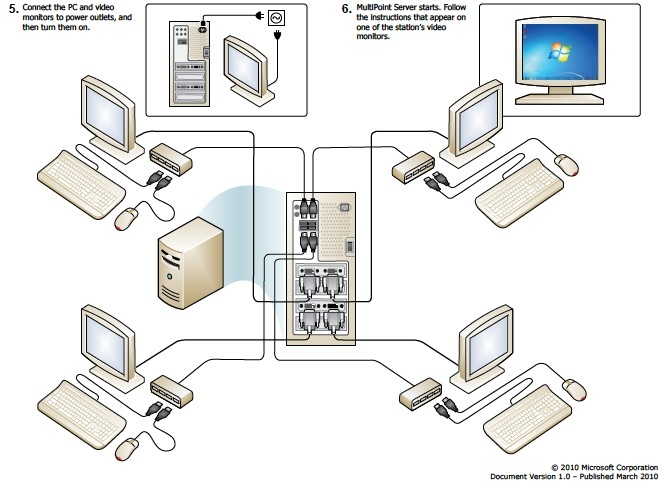 At first was that I couldn't get the keyboard and mice to go to their individual monitors, but after looking at the setup diagram from Microsoft, I realized they needed to be on separate USB hubs, so grouping a set of keyboard and mouse onto the same set of USB port at the back of the motherboard worked. The MultiPoint Manager then showed the monitor, keyboard, and mouse all grouped together and linked to their respective stations. 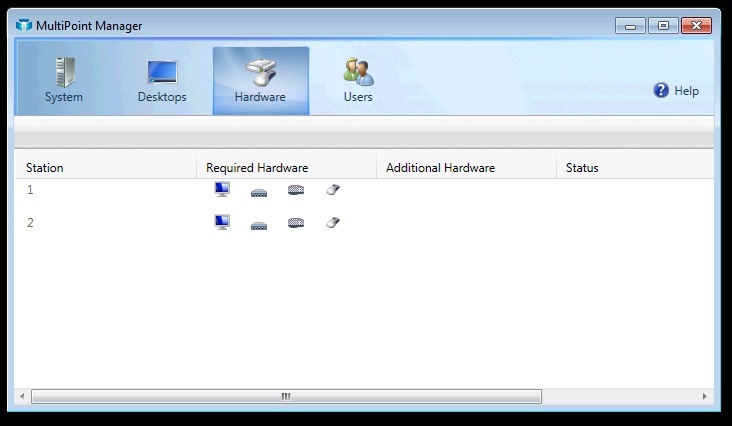 Since MultiPoint Server is actually running as a remote desktop service, and the individual stations are behaving as if they're running remote desktop clients, not to mention this is a Microsoft product and not a hack like all other multiseat Windows solutions, the entire setup is completely stable. Unlike BeTwin that I mentioned above, it also works with all hardware that are supported by Windows. However, running as remote desktop also means everything is slightly laggy due to the remote desktop protocol. I could only connect two stations to my motherboard since I only have two video outputs on my mainboard. To connect more I would need either another video card, or one of those USB DisplayLink adapters. HP also makes the MultiSeat t100, a MultiPoint Server specific thin terminal that has everything built into a small box. MultiPoint Server is actually designed for the academic sector, to reduce costs of computers for schools, especially in emerging markets. However, the cost saving may be limited, since only the cost of one (or more) computer can be saved. The software license is still required. For example, Microsoft Office's license is based on the number of users, and not on the number of system it's installed on. Saving from reduced usage of electricity is also limited, unless you're saving the planet. I looked at our relatively cheap electricity costs, the amount of money I could save by using four full computers vs. one single MultiPoint Server with four heads is less than $1 per year. Finally, one issue I ran into is that since MultiPoint Server is based on Windows Server, many programs that detect the operating system due to either OS differences or (more likely) licensing issues, won't install. So even if the academic institution saved money in hardware purchases, they may need to purchase different software designed to run on a server OS. Seems a lot like the ncomputing product. Been using that a couple years now (the X350 version). I have a question, Windows Multipoint Server say just have support for 10 users, but if I for example, I am using 30 users, is possible? In the case of nComputing can support up 30 users if I am using 3 Virtual Machines, then I can have 90 users but in the case of Windows Multipoint is the same? is supporting Virtualization systems? There's nothing stopping you from installing MultiPoint Server inside a virtual machine so it is possible to have more than 10 users. "I looked at our relatively cheap electricity costs, the amount of money I could save by using four full computers vs. one single MultiPoint Server with four heads is less than $1 per year." It's true, our electricity bill is something like US$70,000 per *month*, and we pay in large chunks of units because we're in an industrial zone. Computers don't use a lot of electricity compared to the other industrial machines we have. What if there are more than 10 users? I don't know if that's possible. Its easy to install - with Gentoo Linux theres allways good howtos.